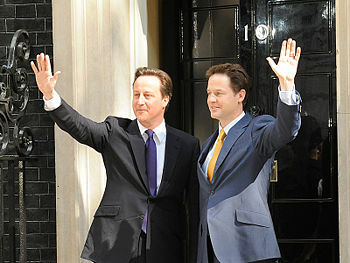 David Cameron (left) has been UK Prime Minister since May 2010; Nick Clegg is Deputy Prime Minister. Prime Minister is a term used to describe the head of an elected government or the principal minister of a sovereign or state. The term originated in the United Kingdom though until the early 20th century it was unofficial. In many places they coexist with a monarchy. ↑ Prime Minister. Oxford Dictionaries. Oxford University Press (2014). Retrieved on 22 April 2014. ↑ Past Prime Ministers. GOV.UK. Government Digital Service (2014). Retrieved on 22 April 2014. This page was last modified 04:24, 22 April 2014.